Hang on… Not another Superhero! 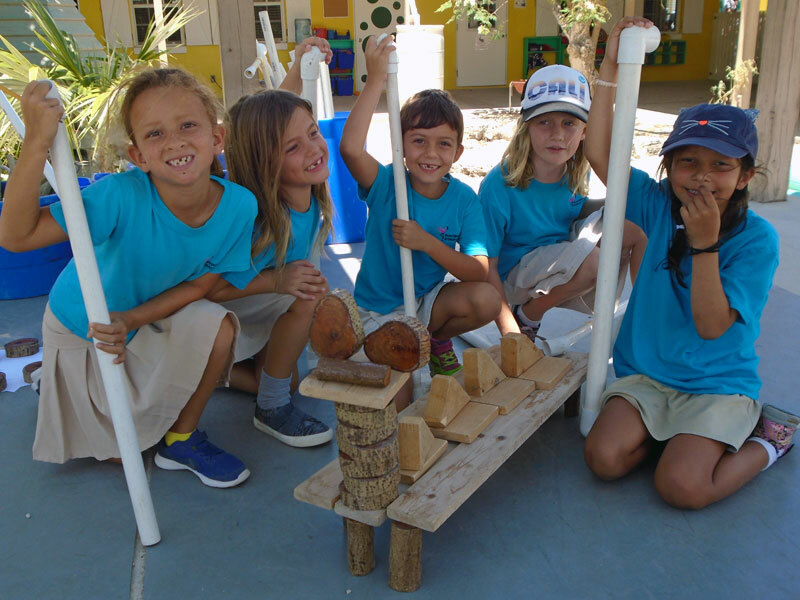 You might begin reading this blog, thinking, surely Year 1 and Year 2 have run out of superheroes to meet… after all Turks and Caicos is a small island! How wrong could you be! Our third visitor this time was no other than superhero Police Officer Peart–Barret all the way from Chalk Sound police station. 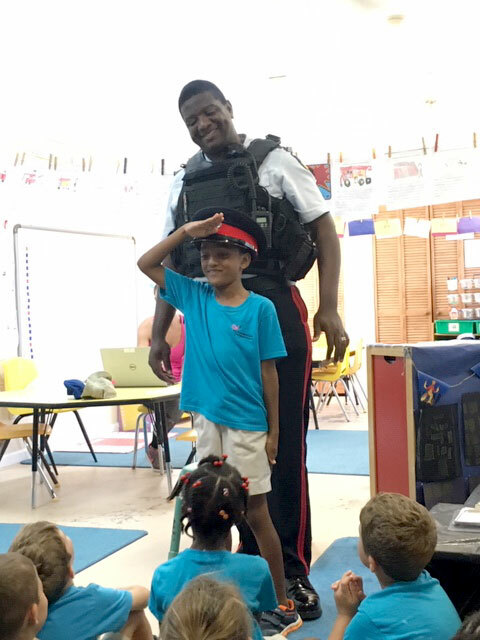 Police Officer Peart–Barret surprised us by coming to talk about his role within the community and answering the many, many questions the children had to ask him! He explained exactly how he helps the community before showing us some of his very special police equipment. This included a police radio, handcuffs, his police notebook and most importantly, his very own superhero badge. Last week, Year 1 and Year 2 were lucky enough to be surprised by community Superhero, Dr Jo. She gave us an amazing insight into what it takes to be a Superhero Doctor. Would you believe that this week, we had another surprise Community Superhero come to Provo Primary School?! 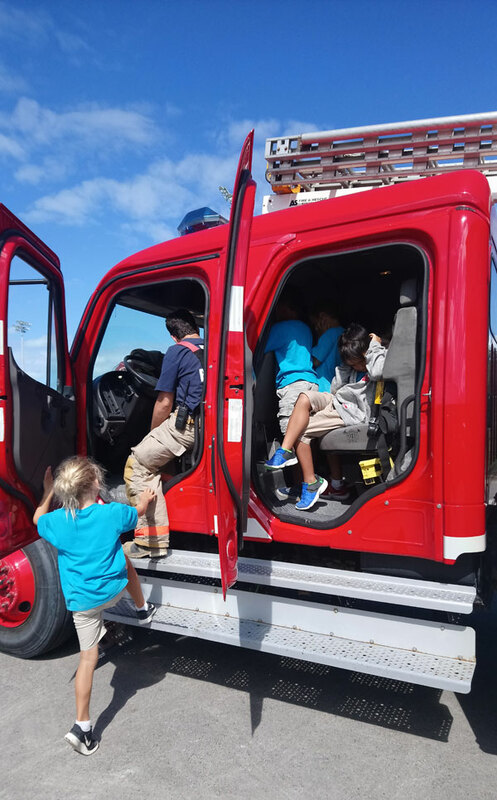 Firefighter Gula arrived in his Fire engine to talk to us about how he serves the community, along with other men and women, as a member of the Turks and Caicos Fire and Rescue Service. Have you ever met a superhero…? We have! Year 1 and Year 2 were truly in awe after meeting a real – life superhero. From the clues, can you guess who we might have met? 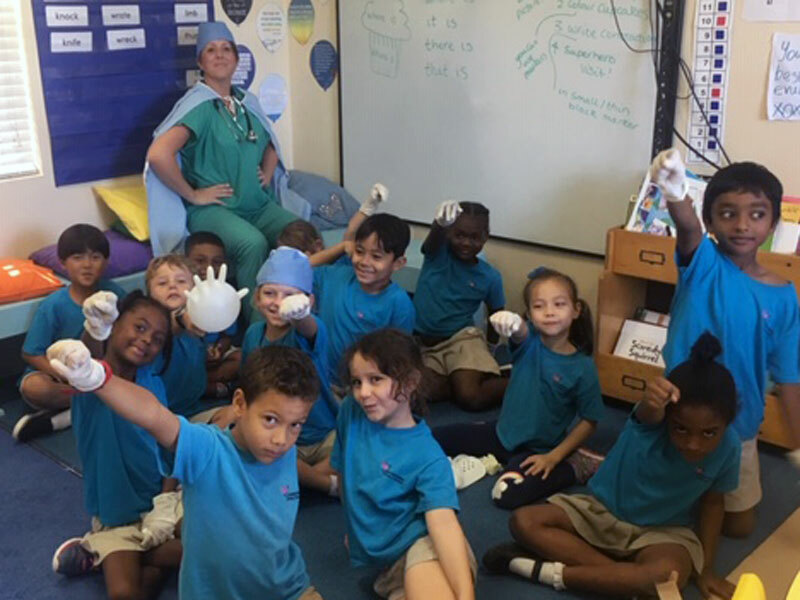 They defeat germs and sickness, they take care of people, wear scrubs as their superhero costume and have lots of different tools to help people feel better. Have you guessed it? That’s right… Enter superhero – Dr. Jo! We had a fantastic morning learning all about what makes Dr. Jo such a superhero. She explained what her day to day job is and how she must carefully examine her patients before deciding the best way to take care of them and defeat those horrible germs. Dr Jo showed us some of her tools she uses to examine patients – stethoscopes, thermometers, drips, blood pressure monitors, x – rays and bandages. As you can see Year 1 and Year 2 loved discovering and using all her tools. Year 2 have been learning about Thanksgiving this week. We started by learning and watching the story of how the first Thanksgiving was created. As a class we then spent time discussing what we were thankful for. Our class ideas ranged from being thankful to police officers/doctors and nurses/fire fighters/soldiers for taking care of us, being thankful to the school and the teachers, our family and friends, the Earth, nature and God. The children then individually spent time writing their own messages of thanks. I was really impressed with their thought – provoking ideas and wanted to share some of them with you. Look what we’ve been celebrating in Year 2! Look what we’ve been celebrating! We started this half term by celebrating Halloween. We worked individually to create potential designs for our Halloween Door. Once we had designed them, we looked at them all before taking part in a secret vote. Check out our winning design, hopefully you got to see it at the Halloween Party. She was last seen dancing with the Prince at the Royal Ball and he is very keen to find her and marry her. Luckily, the children in Year 2 have made some wanted posters to try and find her. Please keep a look out, rewards vary from diamond rings, vacations, crowns, gold and even some dollars! Come and have a look at our wanted posters if you need a good description of Cinderella. Year 2 have also been busy writing letters to the Fairy Godmother and writing diary entries about their time at the ball. We then spent time designing our own shoes before finally making them out of clay. Ahoy, me Hearties! It’s the Pirate Captain’s Cuisenaire Rod Challenge! In my role as Principal, every day I take the opportunity to step away from the office admin duties to enjoy spending time in various classes and sharing in all the learning taking place. This week, I had the pleasure of teaching a couple of short numeracy sessions with the Year 2 class. 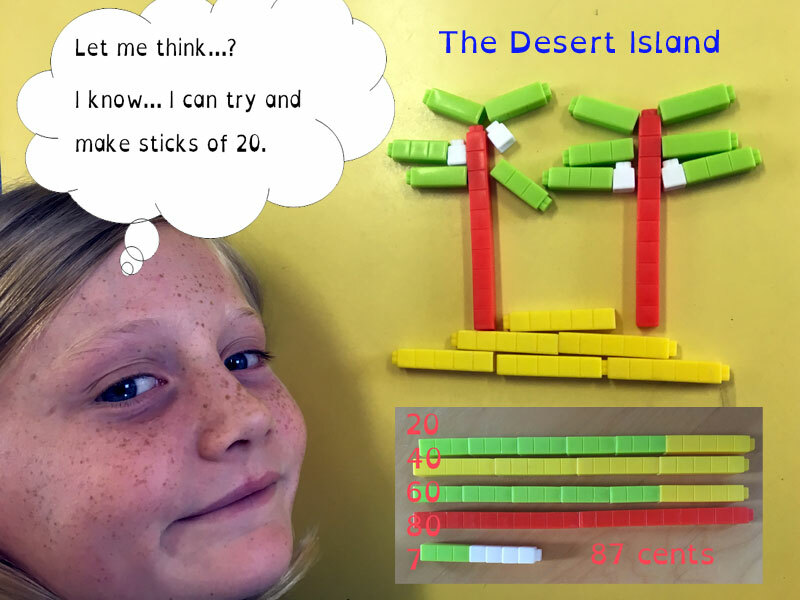 I chose to review and apply their understanding of number bonds/number facts to 10 and 20, using the Cuisenaire Rods. Fitting in with their’ Sea Faring’ class topic, my activities were presented in the context of the children being sailors working for a notorious Pirate Captain (who was known for expecting a hardworking crew, but who also liked to have fun along the way). I have to say… the Captain was extremely pleased with all of the Year 2 sailors – their key number skills were impressive and fortunately no one was made to scrub the poop deck or walk the plank and feed the fish! Take a look at some photos of the mathematical adventure we had together as we weighed anchor and hoisted the mizzen! I think the Year 2s will agree that playing and learning at the same time is fun for everyone! Year 2 & 3 Take to the Ocean! Year 2 & 3 set out on an island-adventure last week – imagining they were exploring undiscovered lands. Year 2, as part of their topic on the seafaring history of the TCI, were ably assisted by their Year 3 friends in a variety of activities. From keeping look-out for other pirate boats (most of which turned out to be tourists, but it’s always important to keep watch!) 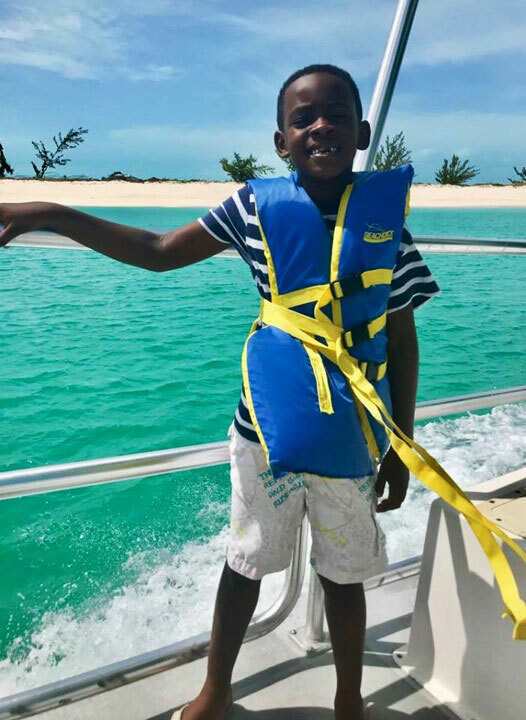 to mapping an uninhabited island, the children had a wonderful trip on our beautiful waters. What a wonderful boat trip – filled with fun and exploration. Time to tessellate in Year Two! 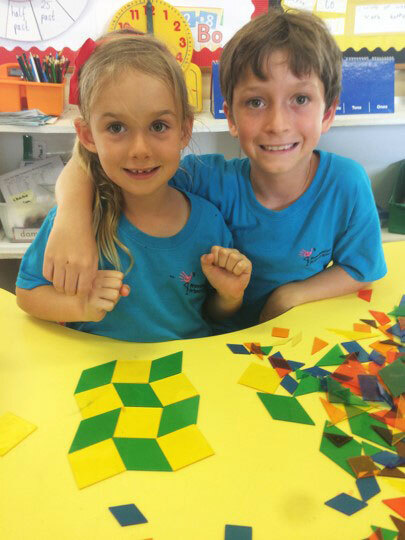 Children in Year 2 have been having fun exploring tessellation while learning about 2D shapes. While devising increasingly complex repeating patterns, children had plenty of opportunity to practice their mathematical language. It turns out, much to Mr Toby’s delight, that “THERE’S NO SUCH SHAPE AS A DIAMOND!” Instead, children learned to ask for a rhombus or parallelogram for their patterns! Children began to talk about whether their patterns were symmetrical and whether they could really be repeated forever if we had enough pieces. Roll Up for the Great Year 2 Bird Competition! Year Two recently enjoyed the book My Dad’s a Birdman by David Almond. Before we reached the finale of the Great Human Bird Competition, we had a go at designing our very own birdmen and birdladies to take part in a flight of our own.We spent time thinking about what would make our design fly the furthest. Would it be large wings that would make the difference? Or should we be concentrating on making our model aerodynamic?! No, forget all that – the design should be light! Wait…that can’t be right…maybe it should be weighted at the front! Everyone had their own theories and everyone thought their design was going to be the winning one! Take a look at our fun designs and watch the slow-motion video to see if you can tell who won the competition! 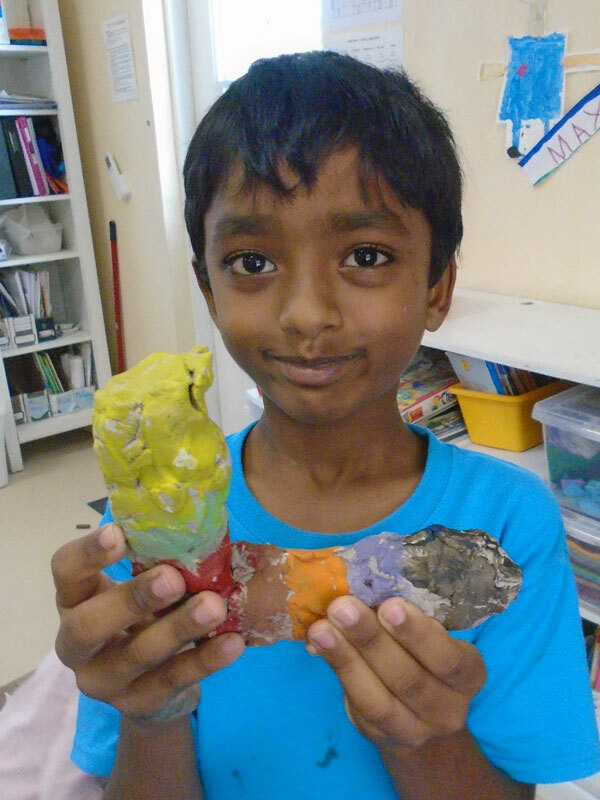 View a snapshot of our week’s learning about our endemic TCI Rock Iguana. Enjoy photos of our toddlers to Year 6 as you listen to the vibes of Correy Forbes and the Rakooneers. A special thank you to ‘Rocky the Iguana’ and Dr. Higgs from The National Trust and Amy Avenant from DECR for visiting us. The ‘Make an Iguana Loose Parts Challenge’ has begun! A group of Year 2s took on the challenge set this lunch time, and wow, what an amazing model they made! Designing their ideas on paper first, and then building together, the group showed great teamwork and creativity! Will others take up the challenge as our ‘Iguana Week’ continues…? In JK and SK, the children took the opportunity to create iguanas from Duplo, playdough and paper. Take a look at the photos of a few of their ingenious iguanas… in fact I’m pretty sure there are lots of photos around the school of other creations being made this week, that just haven’t made it to me yet. Look out for further posts and take a look in your child’s classroom tomorrow to see what you can find! Year 2 find their Rhythm! Music sessions in Year 2 have been filled with fun and noise this term, as children explored tempo, beat, rhythm and notes through a variety of percussion instruments. Children explored how to clap a pulse and rhythm in time with each other. They explored a range of percussion instruments and found which could be used to play long (sustained) notes and which only played short sounds. We then began to think about the rhythm of simple songs, and how long or short notes could be used to make a tune sound slow or fast. They practiced and performed a selection of simple tunes – trying to stay in time and maintain a consistent beat. As all the instruments were percussive, it became a fun game to guess what the hidden tune was. Watch the video to see if you can identify what the children are playing! What does 100 look like? Year 2 can show you! Is it possible to build every number from 1 to 100? How would we do it? Which numbers are the hardest to make? Which number would need the most bricks? Buy your tickets in the school office or on IsleHelp from Monday 27th onwards. Email info@provoprimary.com or call 333 5638 for details or to make a reservation. 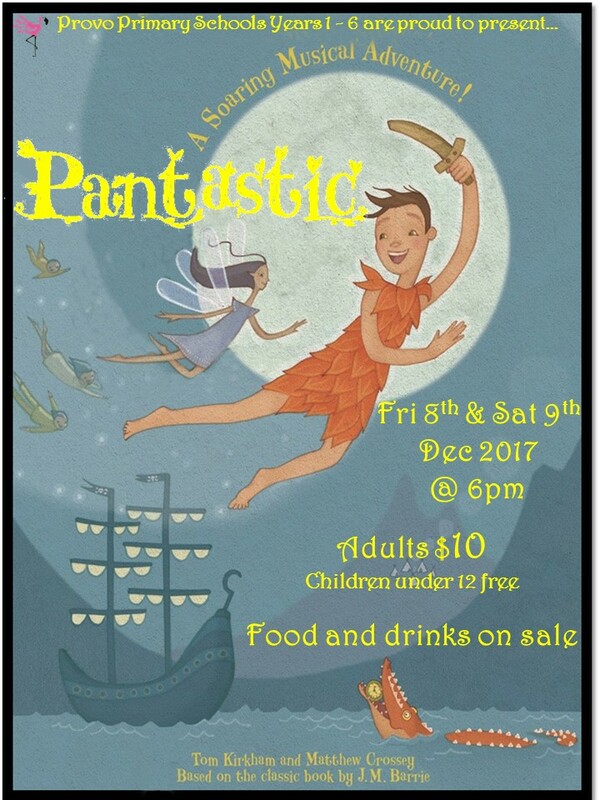 Synopsis: It’s an adventure like no other as Peter Pan whisks the intrepid Darling children off to the fantastical world of Neverland. It’s a world of Lost Boys and villainous pirates, fearsome natives and enchanting fairies. And boy do they fight! When Wendy and Tiger Lily are kidnapped by the pirates, can the ever-youthful Peter find a way to rally the Lost Boys, appease the angry Natives and defeat the pirates once and for all? Or will Captain Hook play his final hand! Year 1 & 2 Fantastic Gymnastics! P.E. in Key Stage 1 has got off to a somewhat wobbly start this year. No, not because of the storms – because children in Year 1 & 2 have been busy developing their body control and balance in our Gymnastics sessions. Sessions start with a range of active and tiring warm-up games aimed at teaching children to be aware of their own space and body movements. Children are improving their skills of observation quickly, while managing their speed and direction to avoid collisions. Warm ups are accompanied by screams and giggles that get all sessions off to a flying start. Wow! What a fabulous ‘behind the scenes’ look the Year 2 students had when they visited the IGA on a field trip. As part of our DT (Design & Technology) project this term, the children have been exploring and creating different cereal box covers. We’ve investigated why we think certain cereals appeal to children – like, maybe there is a fun character on the cover, maybe the box is very colourful, maybe the cereal box uses popular movie characters or even perhaps it offers a free gift inside! We used our trip to the IGA to get more inspiration for our next draft of our cereal box cover. Now, we need to think: How can we add more detail and what improvements can we make? Take a look at all of this amazing art work created by each of our classes from Toddlers to Year 6! I’m sure you’ll agree that it’s absolutely beautiful. Well… it could be yours! Bidding has already started at half day pick up today and will be open again after school. Final bidding will take place at our 25th Anniversary PTA Event at the Shore Club on Saturday evening. All proceeds from the art auction will go to our PTA Funds. We are so proud of all the children for working together with these under the talented, creative direction of Mrs. Yorka and the teachers. Did you know – flamingoes’ legs can sometimes be longer than their entire body? Flamingoes can also live up to 30 years old, and sometimes even 50 if they live in a protected place away from predators. To attract a female flamingo, the male flamingoes perform a synchronized dance whereby they stand together stretching their necks upwards, uttering calls while waving their heads and flapping their wings? We all had fun trying to imitate this dance in Year 3. We wondered if the flamingoes laughed and had as much fun as we did…what beautiful happy birds they are! 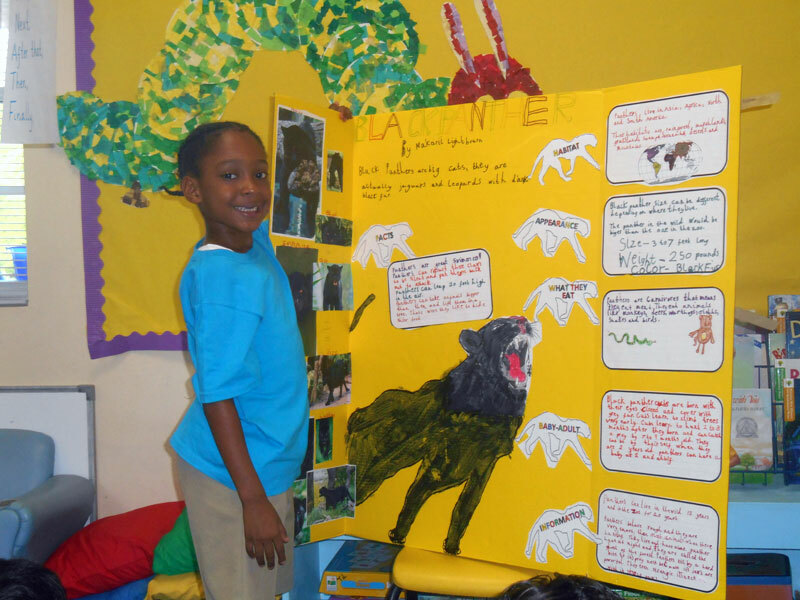 Each year, we dedicate a week to learn in-depth about the local wildlife in our environment here in the Turks and Caicos. This year we are exploring the world of Flamingoes. In previous years we have studied ospreys, sharks and turtles. These are all extra special to us here at Provo Primary as our classes are named after these local animals. Each year, we invite local experts in to talk to us and share their knowledge of the animals, their habitats here in the TCI and about why it is important for us to protect them. Over the past few weeks in Year 2, the children have been exploring measurement. We have looked at measuring cups, rulers, weighing scales and thermometers to figure out how to accurately find out the length/ height, capacity, weight and temperature (how hot or cold) of various objects found around our school. We also thought about where we have seen different examples of the those kinds of measuring tools, such as the scales in the fruit and vegetable area at IGA and the scales at the doctor’s office. Its the Year of the Rooster! Kindergarten and Year 2 have been learning all about Chinese New Year. Chinese New Year was on January 28th. It’s been very interesting finding out about ‘The Spring Festival’ and we’ve really delved into learning about how dragon dances, red envelopes, firecrackers, lanterns and Nian are important to Chinese New Year. We’ve swept and cleaned the classroom to put away old things, bid farewell to the old year, and welcome the New Year, brought good luck to our classes by turning our door red and making red and gold decorations that hung above our doors and even acted out the Chinese New Year story! As a culmination to our learning, Kindergarten and Year 2 joined together to have a joint Chinese New Year party, where the children explored eating with chopsticks (many for the first time!) and tried authentic Chinese food, made by their parents. A lovely time was had by all! Here at Provo Primary we are very proud of our Spanish Language programme and we want to make sure that our parents know just how fantastic it is, the progress their children are making and just how much they can do in Spanish! One of the ways we hope this will be made clearer is through the introduction of our Language Passports. These have also been created to help the children see just how much progress they make from year to year and to keep track of any areas they need to work on. The passport is made up of ‘can do’ statements which the children colour in when they feel they can carry out the statement, and have shown this understanding to the teacher. This allows the children to self-assess their ability and the teacher to understand where the children need help and where they are confident. We will be launching the passports after half-term to Years 1-3 to start with to see how they work. 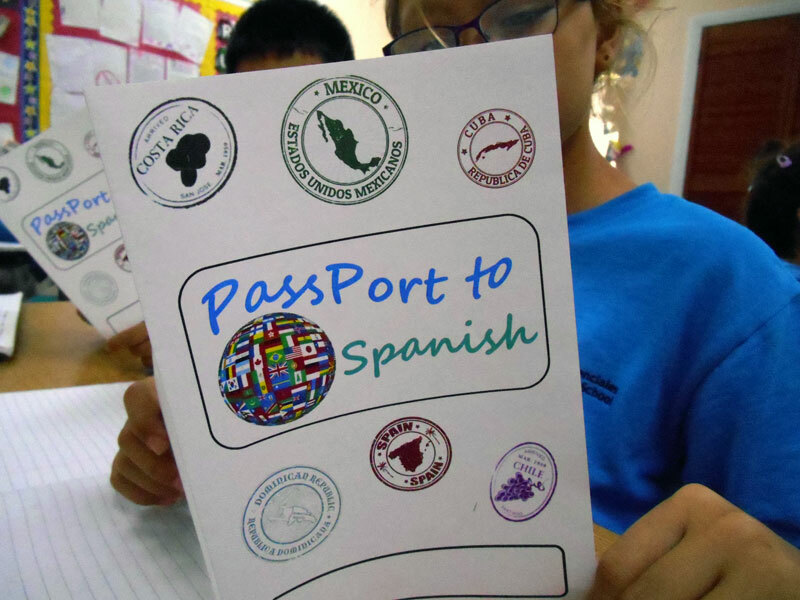 Please feel free to ask Miss Cara or Mrs. Yorka to see your child’s ‘Passport to Spanish’. The highlight of National Heritage month for us all in Year 1 and 2 was our fantastic Maskanoo Parade. We had a lot to do to prepare for an extravaganza such as Maskanoo. We made colourful masks and hats with Ms. Tracy. This involved painting them very bright colours and decorating them with sequins and feathers. Can you spot who is who in our parade photos? We are very well disguised so it is very tricky, look carefully! Maskanoo is an annual Turks and Caicos street festival held on December 26th (Boxing Day). Learn more about the history of this tradition here. Perhaps you and your family will join in with the Maskanoo celebrations this Boxing Day. 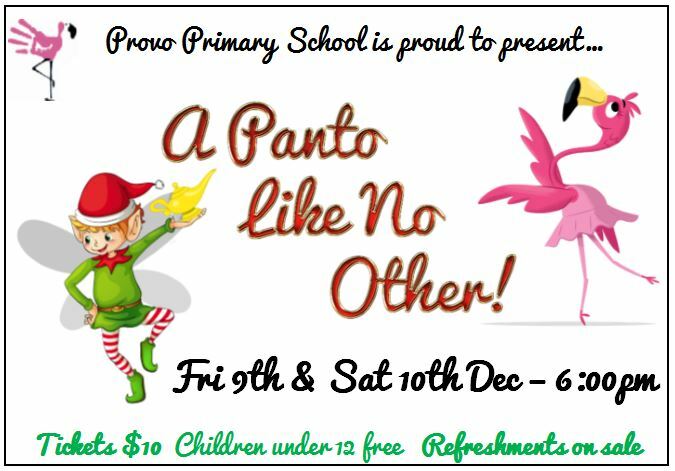 A Panto Like No Other – Tickets on Sale! Come join us for our special 25th anniversary production! Buy your tickets directly on the IsleHelp or in the school office. Email info@provoprimary.com or call 441 5638 for details. Wow! 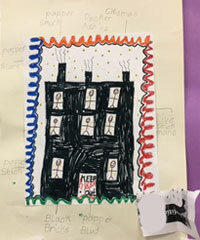 Year 2 completed their first home learning project of the year and they did a fantastic job! As part of our Science in school, we have been investigating all about animals. Through our reading comprehension sheets, non-fiction books and videos we’ve learned a lot about animals, including humans! The children were allowed to choose an animal and investigate it, while answering a few specific questions such as where the animal lives, what it looks like, what it eats, how it grows from baby to adult and any other interesting facts they found out and wanted to share. I was very impressed by their work during this term in Science and was very happy to see that the children’s enthusiasm was shared at home! The children did a great job sharing their knowledge with their classmates and answering questions posed by them.